Along the 22 miles of English Riviera coastline are 20 beaches and coves, including Torquay Beach, Goodrington Sands & Babbacombe Beach. Torbay has topped the charts for a number of years with the best beaches in the country, scooping up to many fantastic awards. The prestigious Blue Flag continues to fly high and has flown over many beaches such as Oddicombe, Meadfoot, Paignton, Broadsands and Brixham Breakwater. Please check blueflag.org for each of the years awards as they may change. Torbay beaches often retain their Quality Coast Awards for being clean and safe. They are generally Maidencombe, Oddicombe, Meadfoot, Preston, Broadsands, Ansteys Cove, Torre Abbey Sands, Paignton, Goodrington and Breakwater. The Environment Agency has been taking water samples across Torbay and the beaches have been identified as meeting stringent water quality standards for both the awards set by the Keep Britain Tidy group. They had to pass strict criteria on a number of aspects of beach management including safety, access, facilities on offer, good litter management and bathing water quality. Along the 22 miles of English Riviera coastline are 20 beaches and coves. Some are wide, sandy beaches, others are smaller and more secluded. Many of the beaches hold coveted awards for cleanliness and quality. Whilst exploring Torquay’s beaches, you’ll find that many are linked by the South West Coast Path. Stretching from the south side of Brixham to Maidencombe, this walk around the Bay offers excellent and varied walking with spectacular sea views. You will find beach cafes and watering holes for the thirsty and a wide variety of flora and fauna for naturalists. If you like water sports, fishing, boating, or just lazing the day away, the coastline of Torbay has a wide variety on offer. Access – Generally easy, but steep in places. Facilities – Ample parking near , dogs allowed, swimming, safe with care, warning flags in operation, life saving equipment, toilets above Maidencombe beach, cafe / refreshments, deck chair / sun bed hire, public telephone, disabled access. Facilities – Ample parking, dogs allowed, swimming, safe with care, warning flags in operation, life saving equipment, toilets by Watcombe beach, cafe / refreshments, deck chair / sun bed hire, public telephone. Facilities – Parking – 1/2 mile from Oddicombe beach, dogs banned, swimming, safe with care, warning flags in operation, life saving equipment, first aid post, toilets by Oddicombe beach, baby changing facilities, cafe / refreshments, beach shop, deck chair / sun bed hire, public telephone. 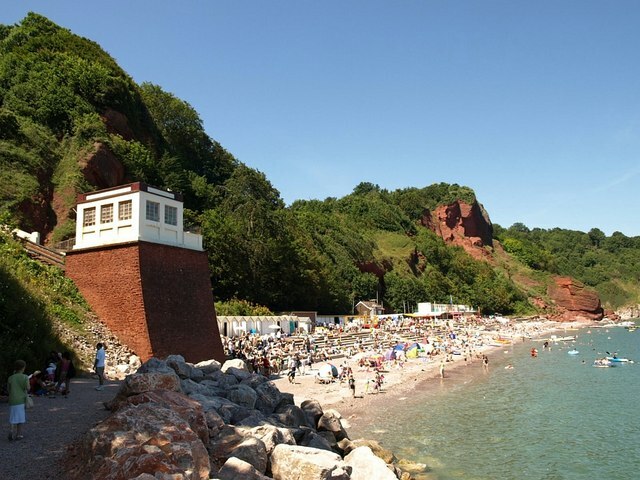 Facilities – Limited parking near Babbacombe beach, dogs allowed, swimming, safe with care, warning flags in operation, life saving equipment, toilets by Babbacombe beach, cafe / refreshments, deck chair / sun bed hire, public telephone. Facilities – Parking 1/4 mile from Ansteys Cove, dogs allowed, swimming, safe with care, warning flags in operation, life saving equipment, toilets near Ansteys Cove, cafe / refreshments, beach shop, deck chair / sun bed hire, chalet hire, public telephone. Facilities – Ample parking near Meadfoot beach, dogs allowed, swimming, safe with care, life saving equipment, toilets by Meadfoot beach, baby changing facilities, cafe / refreshments, deck chair / sun bed hire, chalet hire, public telephone. Facilities – Ample parking, dogs banned, swimming, safe with care, warning flags in operation, life saving equipment, first aid post, toilets near Torre Abbey Sands, cafe / refreshments, deck chair / sun bed hire, public telephone. Facilities – Parking 1/4 mile from Corbyn Head, dogs banned, swimming, safe with care, warning flags in operation, life saving equipment, toilets nearby, deck chair / sun bed hire, chalet hire, toilets near Corbyn Head. Facilities – Parking 1 mile from Hollicombe beach, dogs banned, swimming, safe with care, life saving equipment, toilets by beach, toilets near Hollicombe beach. Facilities – Ample parking near Paignton beach, dogs banned, swimming, safe with care, warning flags in operation, life saving equipment, first aid post, cafe / refreshments, restaurant, beach shop, deck chair / sun bed hire, public telephone, toilets near Paignton beach. Facilities – Ample parking near Goodrington Sands, dogs allowed, swimming, safe with care, warning flags in operation, toilets near Goodrington Sands, cafe / refreshments, restaurant, beach shop, deck chair / sun bed hire. Facilities – Ample parking near Paignton beach, dogs allowed, swimming, safe with care, warning flags in operation, life saving equipment, first aid post, cafe / refreshments, restaurant, beach shop, deck chair / sun bed hire, public telephone, toilets.